Because we treat the whole person, Berkeley Naturopathic Medical Group takes time to get to know you. To get the most out of our services, a new patient will begin with a first office call and follow up with a return office visit 2-6 weeks later. Additional appointments vary depending on your treatment plan. For more information on initial and follow-up visits, please visit our What to Expect page. 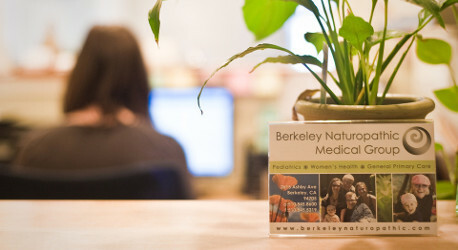 At Berkeley Naturopathic Medical Group, we aim to provide the highest quality of care and service. Our policies support you in the best way possible and keep our clinic running smoothly for the benefit of every patient. At Berkeley Naturopathic Medical Group, we respect your time and trust that you respect ours. We require a minimum of 2 business days’ (by 5:00 p.m., not counting Saturdays and Sundays) notice for return patients and 3 business days’ notice for new patients when canceling or rescheduling appointments. If we do not receive a minimum of 2-3 business days’ notice, you will incur a credit card charge for 100% of the scheduled office visit cost. Please understand that this policy is in place as a means of respecting the time and efforts of your doctor and her office staff, as well as other patients who would have benefited from a medical visit during this time. Should we have to change appointments, we will do our best to give you 2 business days’ notice and will be sure to accommodate your needs and reschedule your appointment in a timely fashion. Naturopathic treatments are individualized and often require multiple changes in diet and lifestyle. As such, we do not offer consultations via email. Because the changes can be complex, you may need to clarify a matter regarding your current treatment plan before your follow-up appointment. You may email the office with short, concise questions that should be no more that 3-5 lines long and pertain to your current treatment plan. Email is not a substitute for an office visit. If your doctor determines that your email is too complex, requires an in-depth explanation or professional advice, or will result in an alteration to your treatment plan, please know that your email will be forwarded to our staff. They will contact you to schedule a 15-30 minute phone consult with your doctor so that your question may be adequately and appropriately addressed. These calls are billed at the regular in-office rate with payment due via credit card at the end of each call. To report acute symptoms not requiring emergency care, please call our office at 510-845-8600. In an emergency, do not email or call us. Call 911 or proceed to the ER. We are now working with Fullscript to offer patients access to their recommended supplements and other natural products. Fullscript is an online dispensary specializing in top quality, physician-only brands that are shipped to your home. Because your health insurance policy is a contract between you and your insurance company, you are responsible for understanding your coverage. Many private insurance companies have policies that do cover some or part of the care you receive from Berkeley Naturopathic Medical Group. Whether your particular policy is one that has such coverage is a detail verify with your insurance agent; our office does not have access to this information. All charges incurred at our office are your responsibility regardless of insurance coverage. Payment in full is due at the time of service. This includes fees for medical office visits, labs and any herbal/nutritional supplements prescribed for you. For your convenience we accept cash, check, Visa, MasterCard and PayPal. At your request, you will be provided with a superbill that you can submit to your insurance company for possible reimbursement. Berkeley Naturopathic Medical Group does not bill insurance and federal programs such as Medicare and Medicaid do not currently reimburse for naturopathic medical services. Bounced checks incur a $45 processing fee. Refunds on labs are available with a $25 processing fee, provided labs were not performed, kits were not tampered with and are returned in a reusable state no later than 6 months after their issue. There are no refunds on services.